Refurbishment and remodeling of the Edward Herbert Building first floor at Loughborough university saw Woodhead deliver : a Christian Chapel, Multi-faith prayer rooms, male and female Muslim prayer rooms, ablution facilities, WC’s, kitchen, office, stores and reception area. The first floor of the Edward Herbert Building had previously been a dining suite and nutrition lounge area but this space had been vacated to accommodate the relocation of the Centre for Faith and Spirituality (previously based at the Brockington Building on the same campus). Due to the design of the building some of the areas and existing rooms within it had no natural lighting. Woodhead installed a ‘Parans fibre optic lighting system’. The solar collectors track the sun’s arc throughout the day and provide natural daylight into the spaces with no external windows. A live site presents many challenges; on this project sensitivity to university staff was paramount. Personnel from the onsite kitchen used the same access routes to the site as Woodhead (including their food deliveries). The kitchen’s working hours were 7.30am to 4.30pm Monday to Friday, Woodhead scheduled deliveries after 9.30am to minimise impact. A one way system was adopted around an onsite island to reduce congestion and prevent reversing. The access route needed to be maintained and free from debris/materials at all times so any unloading of materials were undertaken on the site. The site manager continually liaised with the estates team with information and updates being posted to the university on a regular basis to ensure minimal impact to all on site. The safety of the public outside the site was constantly monitored with footpaths, diversions and safety signage in place for the duration of the works. 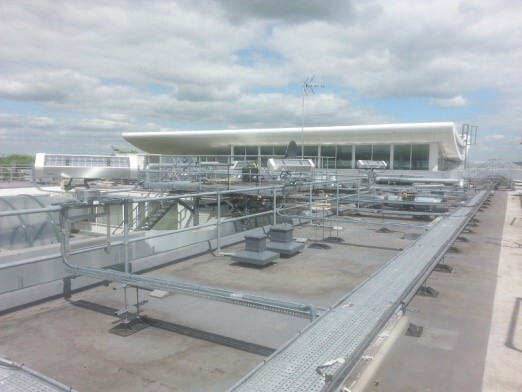 The impact of air and noise pollution was minimised by working methods, equipment, programming, monitoring and all louder aspects of the project being undertaken outside of normal working hours. Woodhead supported the local community throughout the duration of the project. The site used local contractors, primarily engaging with SME’s. For the duration of the project there was a local student on site gaining invaluable work experience. Robert Woodhead Limited outlined and implemented good practice principles across the entire project. The project demonstrated best site management practices and was registered with the Considerate Constructors Scheme and achieved a respectable 36 out of 50. “I have been very pleased with the communication given from the Woodhead team. This has been really appreciated by the university and the cooperation has been great. Noise has been kept to a minimum regardless of the work that has been completed. I am really pleased with the teams’ attitude and cooperation. All the individuals on site have all been excellent and very polite. The mess and noise has been kept to a minimum regardless of the work that is/ has been completed. I am really pleased with your attitude and cooperation. All the lads working have been excellent and very polite”.